Tyler left yesterday for Kuwait. They flew out of Wisconsin and landed in Maine before crossing the ocean. 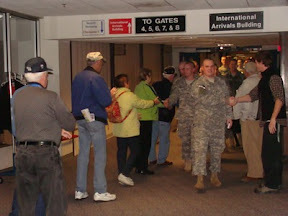 When they got to Maine, they were greeted by the Maine Troop Greeters. They are a group of veterans and volunteers who greet every military flight coming in and out of Bangor International Airport. They take pictures of some of the troops and who happens to be the first one seen coming off the plane? Tyler! You can see all the pictures and read more about greeters at ourstopinmaine.smugmug.com. He texted me from his TextFree account (he doesn't have his cell phone, so text or email me for the number) and said "'Ireland. So far no one has called me a "yank"'. Then, "I kid you not. As we were going down the runway, I saw a herd of sheep less than a stones throw from the plane. Classic :)" That's all I've heard from him so far. I don't know if they are in Kuwait yet or not, but I will keep all of you posted. I'd love to have the number!